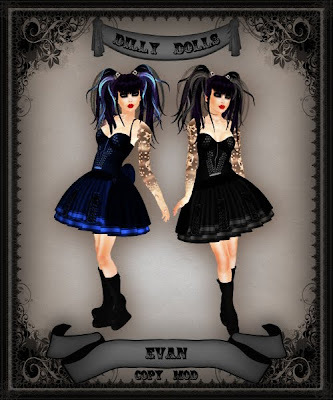 *Dilly Dolls*: Black & Blue Fair goodness! The opening is just a couple of days away, so I thought I would show a lil teaser! Since I am rarely invited to be in fairs, I decided to take advantage of this one, and made a nice lil handful of new things special for the fair! Next up, brand new boots! I have been working on these designs for several months, and finally decided it was time to put them out. They are texture change, as usual, and of course resizable. The Pansa boots have a neat little twist on the heel, with an odd indent in the back, and a shiny sculpted zipper on the boot. The Danielle boots are my favs! Many of you have actually seen me wearing them around SL, and asked where I got them, or when they would be out. Well now, they finally are! They are also texture change, and have a cute lil skull on the bow that can be changed independently as well. There is even the option to not have the skull, if you don't want it. 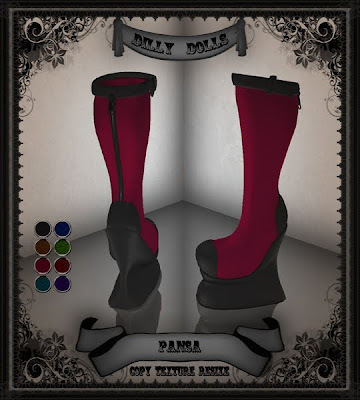 These boots come in a dark and light version. 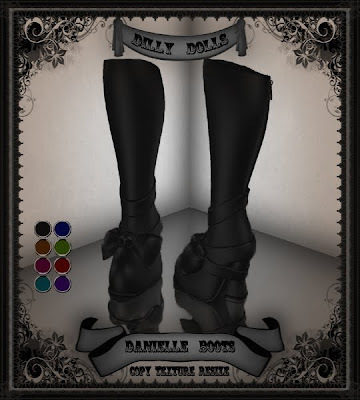 The straps and bows stay black or white, depending on which boot style you have. Evan is all laced up. Many of you asked for more laces, and more laces you got! From the cups, to the bodice, to the skirt, there are enough laces on this dress to tie up 20 pairs of tennis shoes lol. The fair officially opens on the 3th of June (tomorrow), so make some space in your inventory, there is a LOT to get there. Designers from all over, including several of my own friends! See ya there my dollies!